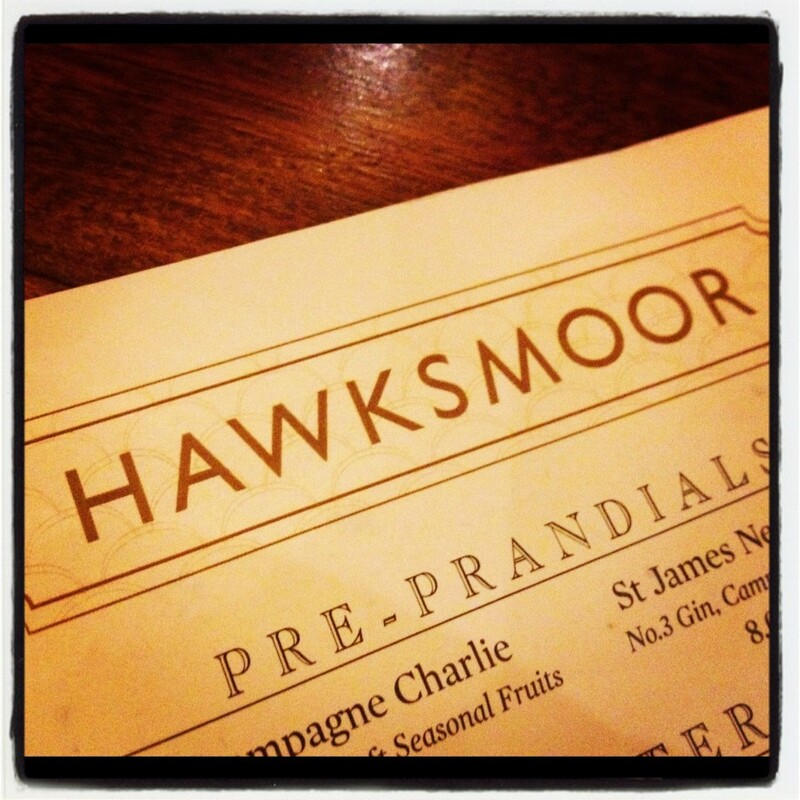 Last weekend my friends and I went to the renowned steakhouse, Hawksmoor, in Covent Garden to celebrate our friend Faiza’s birthday. So even though Hawksmoor is known for its Sunday roasts, I was still very sceptical as to whether it would meet my rather picky standards! It turned out that Sunday was one of the hottest days of the year…not the ideal day to have a heavy, hot lunch. Nevertheless, we excitedly headed to Seven Dials in Covent Garden. The entrance is very grand and as you enter into a rather dark reception area, you are shown downstairs. As you walk down, you enter into a stunning, wood panelled bar, lit with beautiful low lamps and furnished with leather high stools. 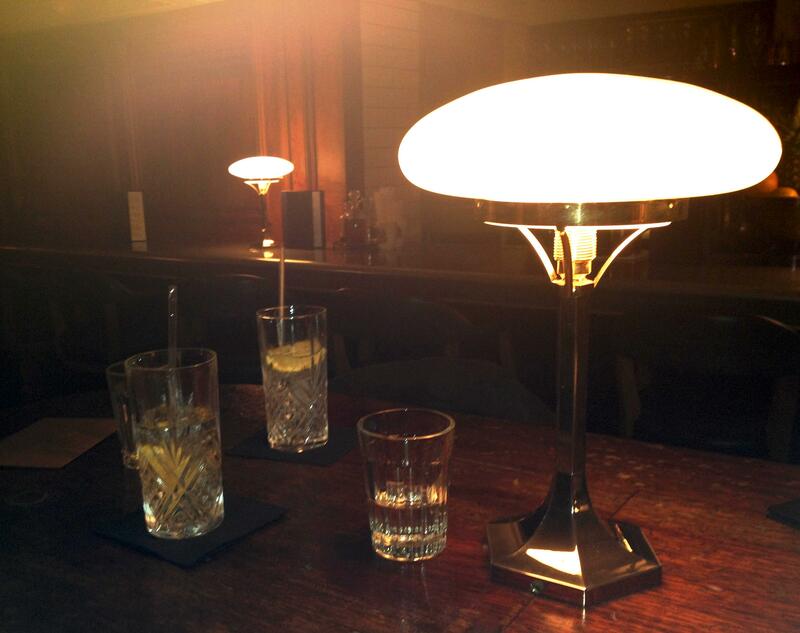 It is the kind of bar in which you would meet with a secret lover. Off to the side, is the entrance into the restaurant. When our table was ready we made our way through the main restaurant which is, quite frankly, huge, and peppered with pillars. Being underground, there is no natural light which was a bit of a shame since it was such a beautiful sunny day. However, the air conditioning was a welcome relief after the stifling tube journey which had taken us there. 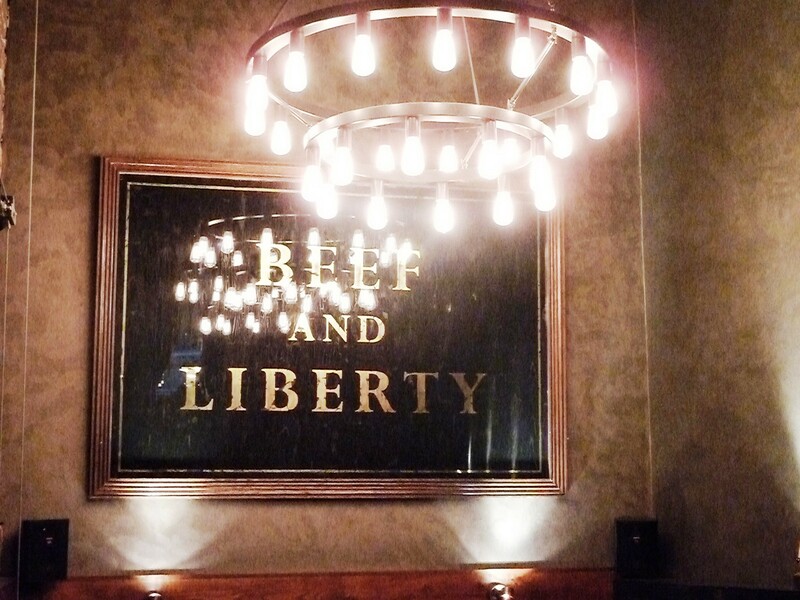 Above our table was a blackboard explaining the cuts of beef available. Our waiter was incredibly knowledgeable and talked us through the full menu, suggesting how much beef would be suitable for one person. I personally am not a great lover of beef. I know, I know, what a waste of time going to the best steakhouse in London! I do like it, I just can’t eat a lot of it in one sitting. So I asked if I was able to get another meat for the roast other than beef. The waiter suggested that I could order the half chicken with the roast trimmings. Everyone else either ordered the beef roast, or the steak. Having seen the size of the plates coming out from the kitchen, we didn’t order any starters. 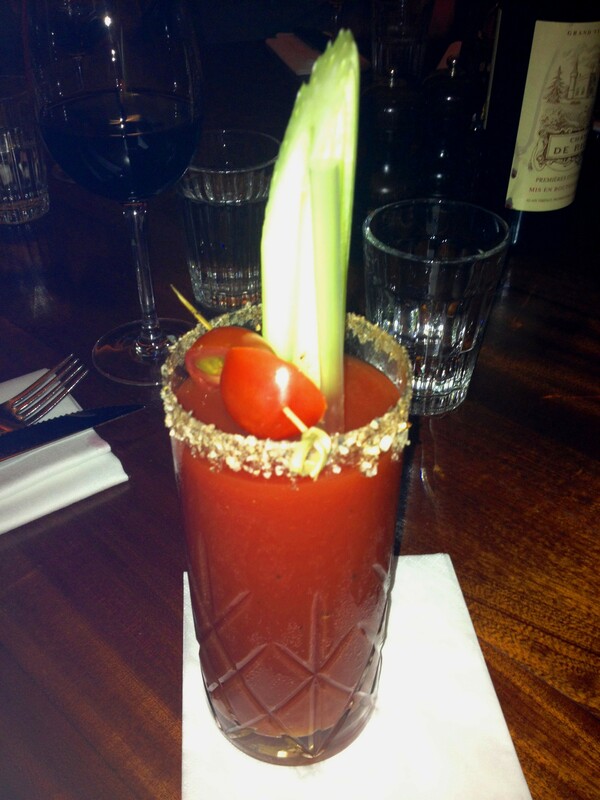 A fabulous Bloody Mary really shifted my hangover from the previous evening. I’m very picky about my Bloody Mary’s (there’s a theme here!) and this really was perfect. When my meal arrived I didn’t quite know where to start. There was so much food! Lying before me was a chicken leg and a chicken breast, a large Yorkshire pudding, holding two roast potatoes (ONLY TWO?! ), cabbage and caramelised carrots. There was also half a roasted garlic bulb and half a roasted shallot. I asked for a side plate to put the chicken breast on so I had a little more space for manoeuvre. The chicken was extremely succulent and tender and had a really lovely charcoal flavour to it. The sides were just as good. The potatoes were golden and perfectly crunchy on the outside and soft and fluffy in the inside, just the way they should be. My only complaint was that there were only two of them. The Yorkshire pudding had the right mix of crispy and chewy and wasn’t at all greasy. The carrots were lovely, although personally I prefer to have parsnips with my roast. It was a lovely addition to have the roasted garlic and shallot accompanying the roast as I always do this at home myself, but this is the first time I’ve seen it in a restaurant. I will never tire of squeezing the soft, golden, sweet garlic out of its paper thin casing. The bone marrow gravy came in little gravy boats and it was delicious. Not too thick, not too runny and with a good, deep, rich flavour to it. I always like a lot of gravy with a roast and no matter how many times we asked for more, the waiter was happy to comply. 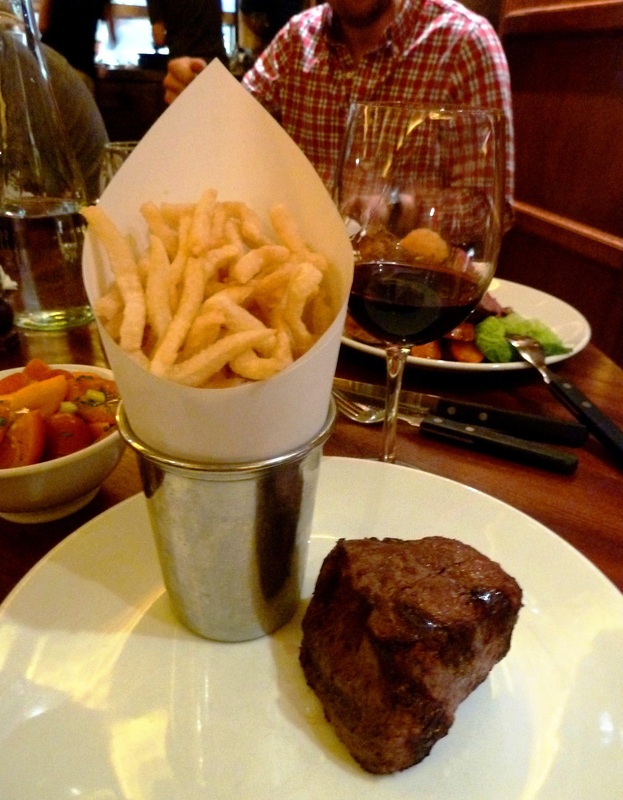 Carmen, who was sitting to my right, ordered the fillet steak. This is £32 on its own. 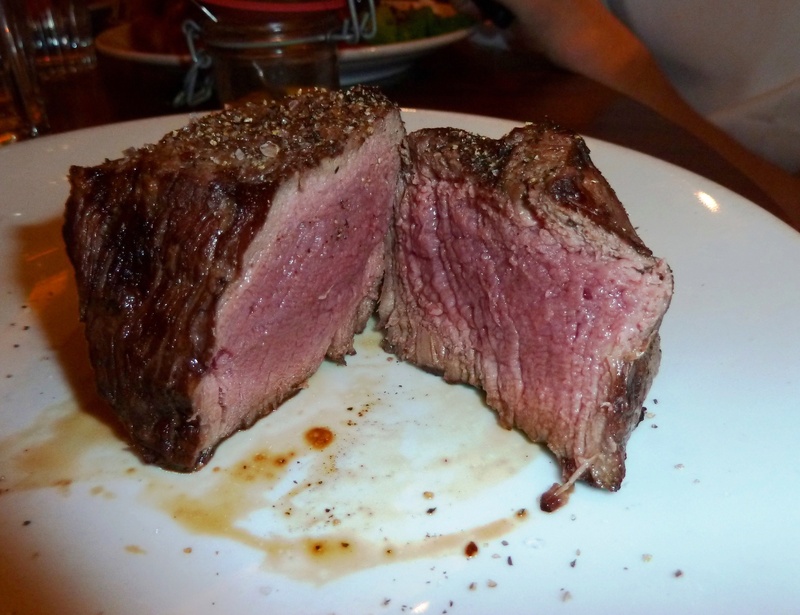 Just the steak, sitting on a plate, all on its own. Sides are additional. Carmen ordered the Heritage Tomato Salad (£5) and a portion of Beef Dripping Chips (£4.50). I tried a small bite of her steak and it was nice. Fine. Nothing special. I really didn’t get the fuss. The chips were a little too thin and crispy. Overall, not impressed. She did rave about her salad for the rest of the afternoon though. Almost to an annoying extent…the more she raved about it, the more I wanted to run back to the restaurant and order a portion to see if it really was as good as she said! But then I tried a bite of Claire’s rump beef from her roast. Oh. My. God. This was incredible. It had the most beautifully deep charcoal flavour and the meat itself felt like butter in my mouth. It literally melted on my tongue. I really wanted to eat more of it but everyone eating the beef roast looked to be having the same experience I was having with it and I didn’t want to take that away from them! It truly was the best piece of beef I have ever tasted. Personally I couldn’t eat that whole slab of meat myself but I would pay the same amount of money for a portion a third of that size. 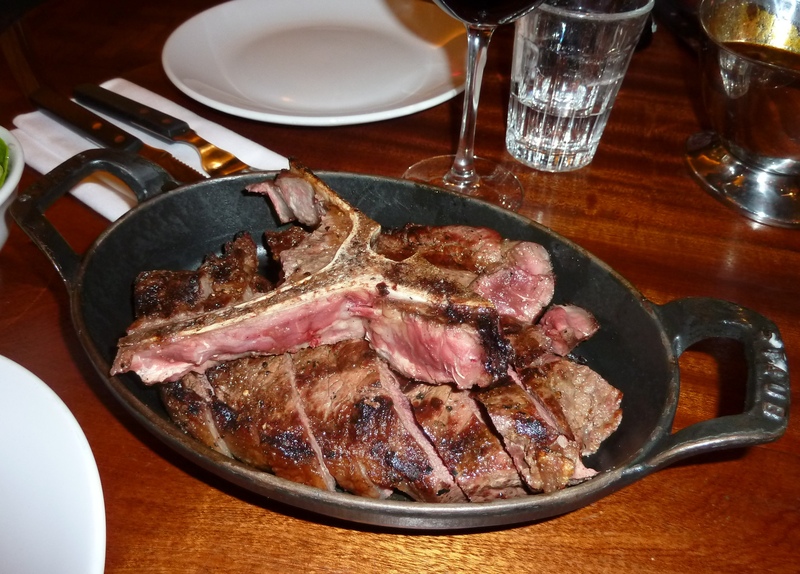 The two Joe’s decided to share the Porterhouse Steak (£8.50/100g). I didn’t try this but my all accounts, it was also delicious. I had to admit…that was a damn good roast. 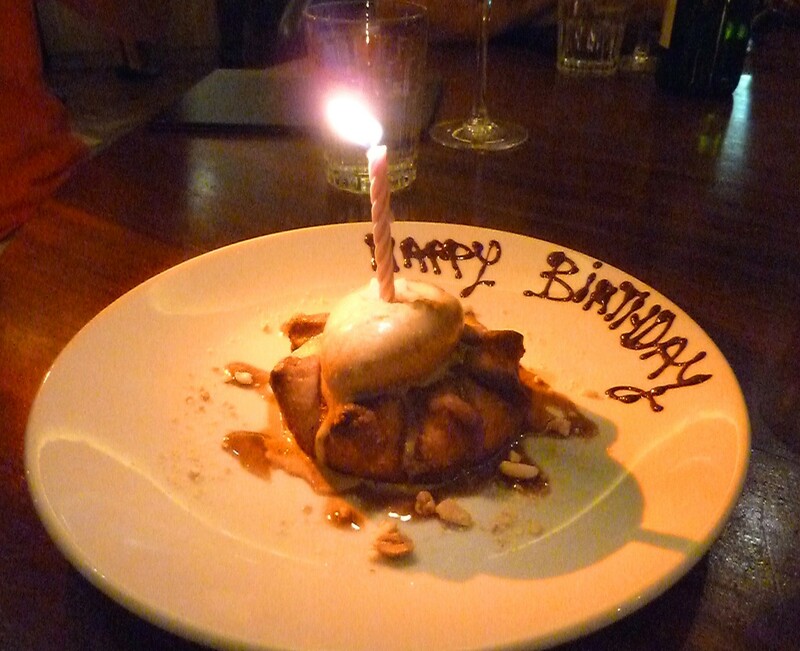 No, not as good as my mum’s, my own, or my friends…but it was the best one I’ve had in a restaurant or pub. 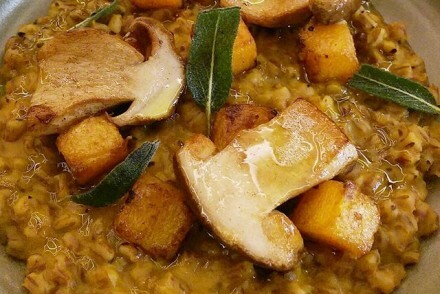 If I had to change anything, I would have liked a couple more potatoes and I would have liked some parsnips. And personally, I prefer broccoli with a roast as opposed to carrots, but that’s just me. Now, you know when you eat a meal and you feel quite full by the end but then you keep getting fuller and fuller even though you’ve finished eating? Well this happened to all of us on Sunday. I had to unzip my skirt! 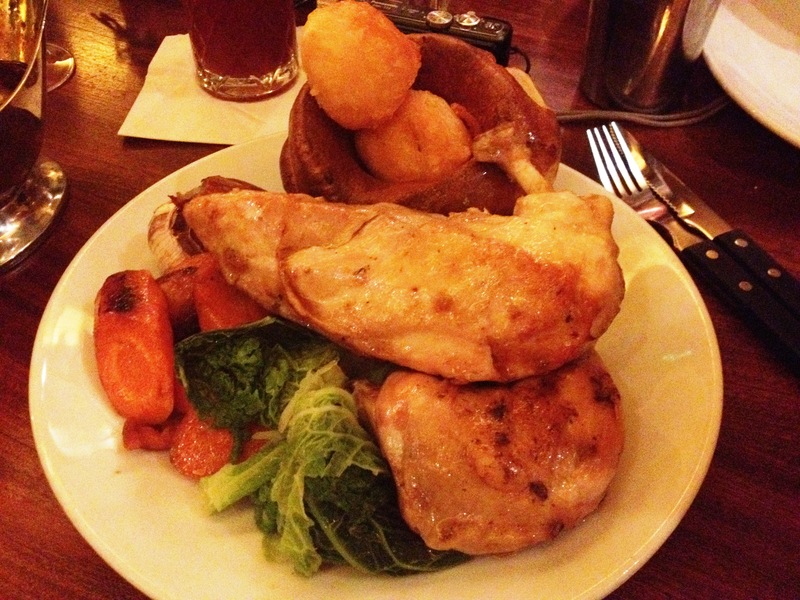 It seems to be the way with roasts…no matter how full you get, you have to finish everything on your plate. It isn’t often that I won’t order a pudding when I’m eating out but on this occasion, I just couldn’t bear to even think about eating anything else, so I ordered a fresh mint tea to help me digest the huge feast I had just devoured. The waiter very kindly brought over a birthday caramel pecan dessert for Faiza which we all had a bite of and it was really delicious. Carmen ordered one scoop of the salted caramel ice-cream which was nice, but not the best I’ve ever had. This is the best salted caramel ice-cream I’ve had. 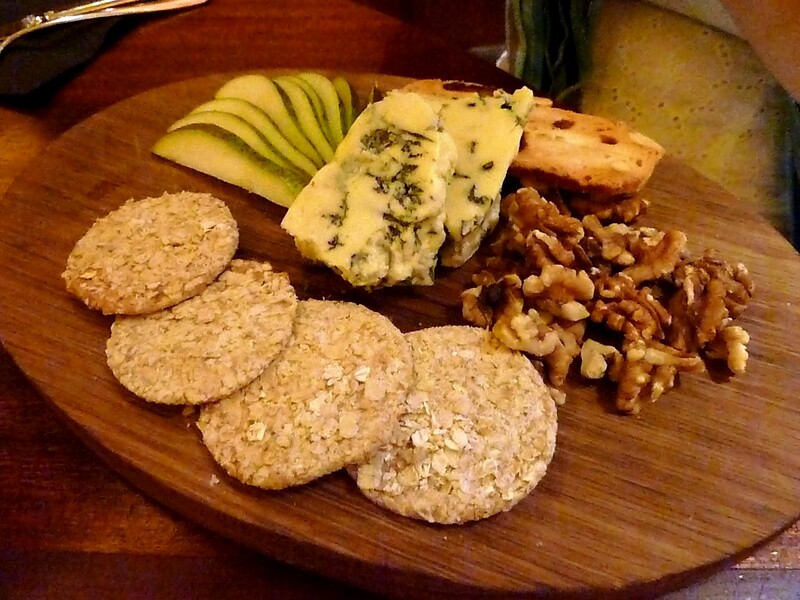 Claire opted for Colston Basset stilton with Pears & walnuts (£5) and had a glass of Port to drink with it. 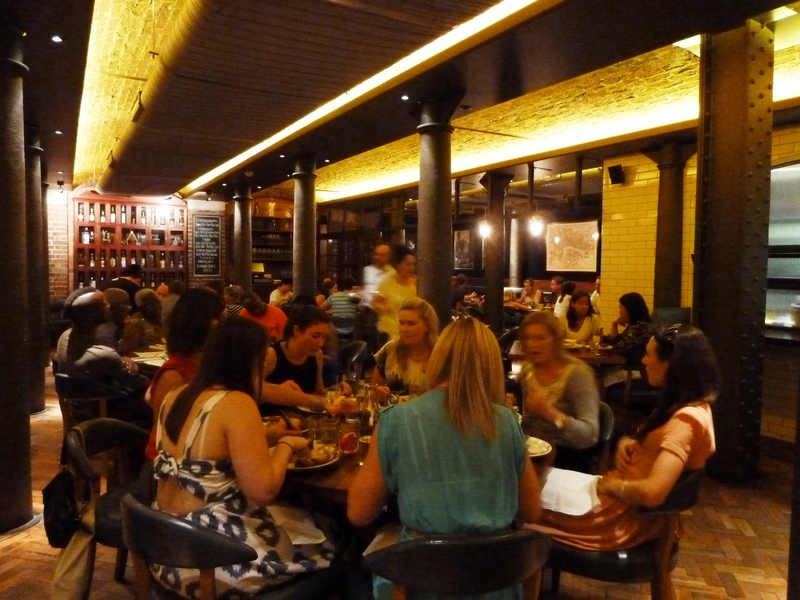 We all left Hawksmoor a lot heavier and a lot happier. 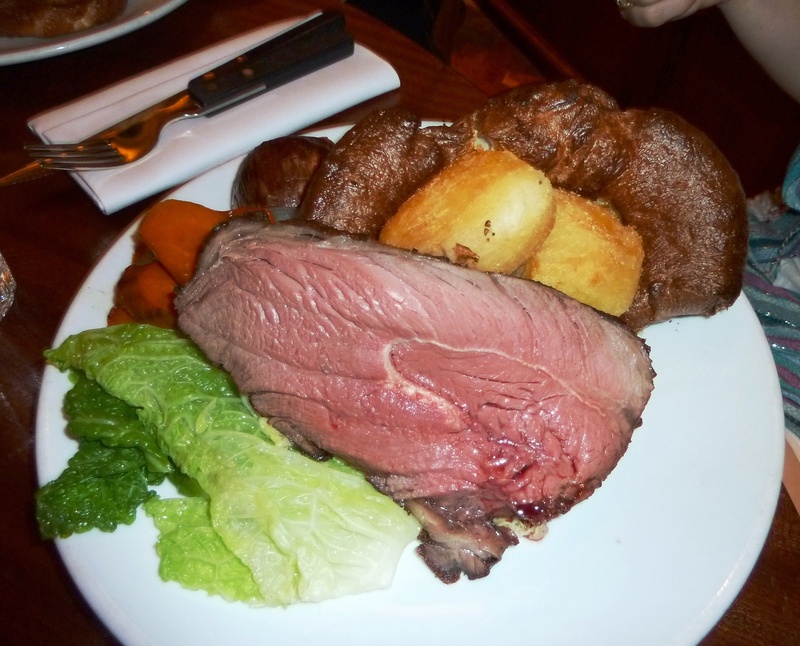 The roast really was a success and definitely deserves its accolade of Best Sunday Lunch in London. I still prefer my own but if I can’t be bothered making one and I fancy a day out, I will definitely be heading back there, especially when the cold Winter days approach us. 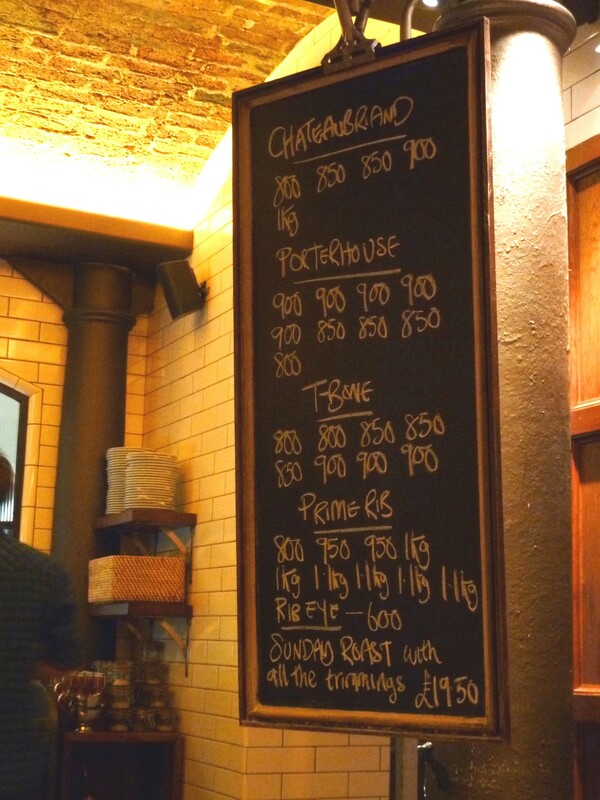 Their beef roast is £19.50, to opt for the chicken, it is £20. 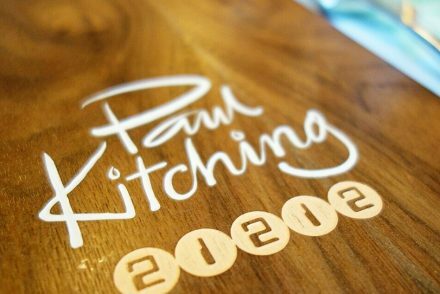 If you’re in London and looking for a good roast, book now! 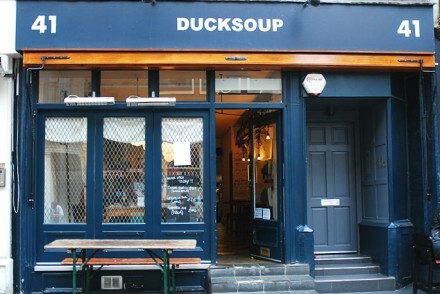 this place looks bloody amazing – I’m going to have to check it out asap!